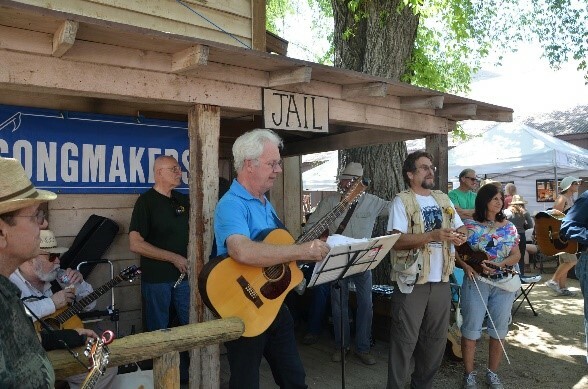 Quite a few of our songmaker mambers volunteer annually at the festival. Please consider volunteering this year if you haven’t done so already. This entry was posted in Topanga Banjo and Fiddle Contest on March 13, 2019 by Song_1953_Makers. 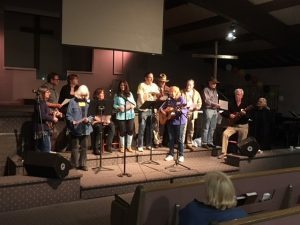 Feb 23 Saturday 1:30-9:30pm: SONGMAKERS ROUNDUP, POTLUCK & ELECTIONS at the Somis Community Church, 3300 West Street, Somis 93066 / 805-386-3175. Please, no alcohol permitted at this facility. From the 101, go north on Lewis Rd, turn left on Bell. From the 118 (Los Angeles Ave), turn south on Lewis Rd, turn right on Bell. This event will be a Board Member Election, Performance, Award Ceremony, Potluck Dinner and Song Circle festivity that cannot be missed! The board members will provide dessert so please make your potluck contribution a main or side dish. This entry was posted in Uncategorized on December 29, 2018 by Song_1953_Makers. Camp De Benneville Pines Music in the Mountains (Lite) in the San Bernardino Mountains. Twenty Songmakers rented the two cabins with cooking facilities last March and we’re doing it again in 2019. Contact Steve Berman or Sandy Lessner for information about the weekend & / or see the Prez Sez in the January Bard Chord. Only a few spots open, especially if willing to sleep in a top bunk. Must have chains for your car in case of snow. For information about the camp facilities (not specifically this event), please visit: https://www.uucamp.org/ and catch the article in the upcoming Bard Chord. This entry was posted in Music in the Mountains on December 28, 2018 by Song_1953_Makers. This entry was posted in Music in the Mountains on October 20, 2018 by Song_1953_Makers. Here are the dates for our Kenney Grove campouts for 2019. We recommend that you go ahead and make reservations for all the dates you think you might attend. You can cancel with a full refund up to 45 days in advance. If you make all your reservations for the year at the same time, you pay only one $3.00 reservation fee. When you make a reservation, if you have a Facebook account, please let us know via the Songmakers Camping News and Discussion group. This link should take you directly there. https://www.facebook.com/groups/707150739666114/ Please ask to join by clicking on the appropriate button there. There are Events set up for each KG camp out. Please let us know that you are coming and which site you’ll be in, if you’re comfortable with that. The contents of this Facebook group are not visible to the general public, only to those who are fellow members. Those of us who continued to camp in 2018 after the County of Ventura took over management found it still a very worthwhile experience. We braved the temporary lack of showers and the changes to our schedule due to park quiet hours requirements. We spoke with rangers and the camp hosts and have been assured that the showers will be ready for use by the time we’re back in April. They have not made us shut down the music at 9 p.m., and we have continued to play quietly even though others share the campground with us. So far, so good! We also learned that Ventura County parks budget is based only on the parks’ and campgrounds’ income. They do not receive county, state or federal funds. So let’s be as happy as possible about sharing our lovely spot with new people…they’ll be helping keep the lights on. You know, when the lights actually work! Thanks to everyone who camped in 2018 and to those of you who are making plans for 2019! Onward! This entry was posted in Kenney Grove on October 20, 2018 by Song_1953_Makers. 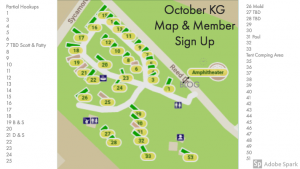 We hear that campers have signed up for the sites around the old campfire area for Labor Day Weekend (August 30-Sept 3) and the Fall Out camp-out October 11-14, and there should be plenty more sites available. RV sites 17 to 26 are those on either side of the creek. Tent sites start with #34 and above. We are also beginning to reserve for Memorial Day Weekend (May 23-27, 2019) since more people may be aware of our hidden gem by next year. The fee for cancelling 45 days or more in advance is minimal. When you do reserve, please post on the Kenney Grove Campout Discussion page at http://songmakers.org/kenney-grove-campouts. Some people have emailed me, that they are coming, but I haven’t been able to keep good track. You may email this address campouts@songmakers.org for the discussion page password. As we did last time, we plan to continue our ice cream social and potluck tradition, and share music in the evenings wherever we can best gather. The coffee pot will be there, too! Remember, if you want to arrive a day early or stay a day later to pack up, you can do that. It used to be that the camp was only open to groups and only on certain days of the month. If you want to take more time to explore the area, you can do that! The ranger I spoke with let me know that many people reserve the night of the day they want to leave, so they don’t have to pack up by 11 a.m. This entry was posted in Kenney Grove on August 21, 2018 by Song_1953_Makers. First of all, congratulations to Mary Zangerle who took 2nd place in the contest in Intermediate Mandolin and to Tim Holtwick, who took 1st place in the Intermediate-Other category playing in the Hawaiian Slack Key guitar instrumental style! Dana and Sally Charette opened the Songmaker stage with a blast of fun! Dana is always amusing, talented and knows how to involve the crowd. Sally is a singer par excellence and got down with her cool repertoire on her rockin’ resonator Uke. Jim Friery and friends, back on the SM stage (actually in front of the stage getting down!) for their second year representing our awesome club, are talented guys who brought fun and harmony and got the audience very involved and singing with gusto. The ever-popular Gemini (Bruce Farewell and Renata Decher) took the 11:00 a.m. slot with wit, and talent. They love to involve the crowd, and young people get their taste for performing because Renata hands them her rhythm instrument! Doug Kerr & Linda Szitkar, first timers to our stage, have an amazingly popular and sing-along-able repertoire! Very well done you two! TJ Zeiler and Steve Linsky and all of HorsePlay band is always a big hit at Topanga. They really draw a crowd with their prodigious talents. Ever the walking juke box, Dean Donin wowed the crowd. Dean has an eclectic repertoire and has a very entertaining performance style! Gary and Kathy Lynch, what can one say? They are excitement and fun personified! Karen Hart and Jennifer Leitham presented a Joni Mitchell Sing-along with professional savvy and deep and wide talent. Thanks for bringing Joni to us with such beauty, skill and charisma! Thank you Steve and Sandie, our President and First Lady who promoted Songmakers throughout the day, and made sure our Banner was mounted! Thanks to all the other Songmakers, unnamed here, who participated, supported and showed the crowd how to have fun! This entry was posted in Topanga Banjo and Fiddle Contest on June 5, 2018 by Song_1953_Makers. Stop by the Songmakers Stage at Topanga and spend some time playing with your fellow Songmakers! This entry was posted in Topanga Banjo and Fiddle Contest on April 20, 2018 by Song_1953_Makers. Hi all! As most of you are probably aware, Rona LeDoux, who has managed Kenney Grove Park camp ground for 37 years, will retire at the end of June, 2018. She transformed the park into the garden spot it is today while maintaining all the campsites and amenities we so enjoy. As a token of our appreciation, Sally and Dana Charette will provide a guest book you are encouraged to sign at the Memorial Day camp out. If you would like to donate a cash contribution to Rona’s “retirement fund,” Sally will collect funds in advance and we will present them to Rona on Memorial Day Weekend. Rona will be relocating from the park, so like a lot of us, she’s downsizing! Inevitably, Rona’s retirement will bring changes to the way the camp is run. 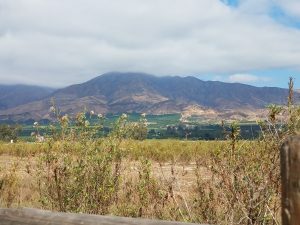 Ventura County Parks is still in the process of re-mapping the campground. I am in touch with VCP regarding group reservations for future Songmakers camping weekends and will let you know how to make reservations as soon as I can. If you’d like to pencil in dates, we are aiming for July 19-22, September 20-24 (Labor Day Weekend), and October 11-15, 2018. 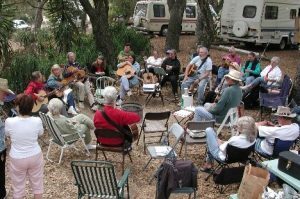 Camping at Kenney Grove has brought Songmakers together for nearly 20 years. It helped us form friendships from all reaches of Southern California, strengthening our club. We’ve learned about music and public performance through workshops and concerts held at KG. I hope you all will join me in honoring this long and rich tradition. The Memorial Day Campout at Kenney Grove will be held May 24 – 28, 2018. Reservations must be received by Saturday, May 19, so mail them by Wed. May 16. You will receive confirmation by return email by Monday, May 21. 1 p.m.-4 p.m. – Ukulele Jam with Alan Ferentz – drop in and play! 4:00 p.m. – Meet with your Band Scramble group to create magic! This entry was posted in Kenney Grove on April 16, 2018 by Song_1953_Makers. The location for Roundup on February 24th was held at Somis Community Church, a new location for us. The facilities were perfect with the sanctuary used for the concert, a green room, a kitchen/eating area and plenty of room for jamming. The event started at 2:00 with an afternoon concert in the church’s sanctuary by the wonderful talent represented by the various song circles and hoots in Songmakers. The church even provided their own sound man leaving some of our key members free to enjoy the concert. 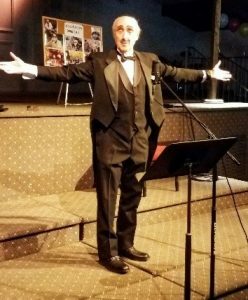 Dana Charette did an awesome job of emceeing the concert with his impersonation of Groucho Marx. Ken Krupnik, Sympatico Music (Bob Bueling & Pat Cronin), Eva Schwerb, Mission Oaks Song Circle, Dale Carter & Linda Moore, Rufus T. Firfly, Simon Lucas, Bryan Chow, Mike & Mary Zangerle, Doug Kerr & Linda Szitkar, Joe Conversino, Sam Gross, Bill Johnson, Jack Zigray, Agoura Hills Song Circle, Bell Arts Song Circle, Arnie Gordon, Steve Linsky, Lien Borg, Camarillo Song Circle, Jerome Rubin, Steve Berman & Sandy Lessner, Dave Gilman, East Valley Hoot, Thousand Oaks Hoot, Linnae Richards and Camarillo Hoot. Voting for the new board members took place throughout the afternoon. The new board members who were voted in were Bill Johnson, Sam Gross and Linnea Richards. Following the concert, our president Steve Berman awarded the following members for their behind the scene contributions to our club. 1. 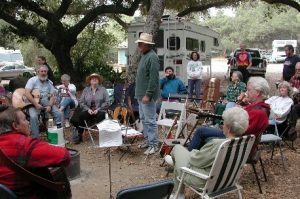 Don Truby – For many years of presenting the well-attended Songwriting Workshops at our musical camping weekends at Kenney Grove Park in Fillmore. No one goes hungry at our Songmaker potlucks. Finally, it was time for jamming with two great song circles that took us all the way till about 10:00. Thank you to everyone who attended and helped to make this year’s Round-Up a big success. Do you have any suggestions for next year? Do you want to be part of next year’s plans as part of the newly formed Roundup Committee? You can email at gelencser.andy @gmail.com. This entry was posted in Roundup on April 16, 2018 by Song_1953_Makers.